Impressment was strongly criticized by those who believed it to be contrary to the British constitution; unlike many of its continental rivals at the time, British subjects were not subject to conscription for military service, with the exception of a brief experiment with army impressment from 1778 to 1780. Though the public opposed conscription in general, impressment was repeatedly upheld by the courts, as it was deemed vital to the strength of the navy and, by extension, to the survival of the British influence and realm. Impressment was essentially a Royal Navy practice, reflecting the size of the British fleet and its substantial manpower demands. While other European navies applied forced recruitment in times of war, this was generally done as an extension of the practice of formal conscription applied by most European armies from the Napoleonic Wars on. The U.S. Continental Navy also applied a form of impressment during the American War of Independence. The impressment of seamen from American ships caused serious tensions between Britain and the Thirteen Colonies in the years leading up to the Revolutionary War. One of the 27 colonial grievances directly highlights the practice. It was again a cause of tension leading up to the War of 1812. After the defeat of Napoleon in 1814, Britain ended the practice; later conscription was not limited to the Royal Navy but covered all armed forces. Until 19th-century reforms improved conditions, the Royal Navy was additionally known to pay wages up to two years in arrears, and it always withheld six months' pay to discourage desertion. Naval wages had been set in 1653, and were not increased until April 1797 after sailors on 80 ships of the Channel Fleet based at Spithead mutinied. Despite this, there were many volunteers for naval service. The work for individual sailors was less than on merchant ships as the naval crew size was determined by the number needed to man guns, around four times the number of crew needed to sail the ship. While the food supplied by the Navy was plentiful and good by the standards of the day, shipowners and governments routinely estimated that 50% of the sailors on a given voyage would die due to scurvy. The main problem with recruitment, though, was a shortage of qualified seamen during wartime, when the Navy quickly had to recruit an extra 20,000 (early 18th century) to 40,000 men (late 18th century). Privateers, the Royal Navy, and the Merchant Navy all competed for a small pool of ordinary and able seamen in wartime, and all three groups were usually short-handed. The recruitment figures presented to Parliament for the years 1755–1757 list 70,566 men, of whom 33,243 were volunteers (47%), 16,953 pressed men (24%), while another 20,370 were also listed as volunteers separately (29%). Although there are no records that explain why volunteers were separated into two groups, it is likely these were pressed men who became "volunteers" to get the sign-up bonus, two months' wages in advance and a higher wage; it is known large numbers did do this. Volunteering also protected the sailor from creditors, as the law forbade collecting debts accrued before enlistment. The main disadvantage was that enlisted deserters who were recaptured would be hanged, whereas pressed men would simply be returned to service. Other records confirm similar percentages throughout the 18th century. All three groups also suffered high levels of desertion. In the 18th century, British desertion rates on naval ships averaged 25% annually, with slight difference between volunteers and pressed men. The rate of desertion started high, then fell heavily after a few months on board a ship, and generally became negligible after a year — because Navy pay ran months or years in arrears, desertion might mean not only abandoning companions in the ship's company, but also the loss of a large amount of money already earned. If a naval ship had taken a prize, a deserting seaman would also forfeit his share of the prize money. In a report on proposed changes to the RN written by Admiral Nelson in 1803, he noted that since 1793 more than 42,000 sailors had deserted. The Impress Service (colloquially called the "press-gang") was formed to force sailors to serve on naval vessels. There was no concept of "joining the navy" as a fixed career-path for non-officers at the time since seamen remained attached to a ship only for the duration of its commission. They were encouraged to stay in the Navy after the commission but could leave to seek other employment when the ship was paid off. Impressment relied on the legal power of the King to call men to military service, as well as to recruit volunteers (who were paid a bounty upon joining, unlike pressed men). Seamen were not covered by Magna Carta and "failure to allow oneself to be pressed" was punishable by hanging, although the punishment became less severe over time. In Elizabethan times a statute regulated impressment as a form of recruitment, and with the introduction of the Vagabonds Act in 1597 men of disrepute (vagrants) found themselves drafted into service. In 1703 an act passed limiting the impressment of men under 18 years of age to those who were not apprenticed. A further act in 1740 raised the maximum age to 55. Although no foreigner could normally be pressed, they lost their protection if they married a British woman or had worked on a British merchant ship for two years. Some governments, including Britain, issued "Protections" against impressment which protected men had to carry on their person at all times; but in times of crisis the Admiralty would order a "hot press", which meant that no-one remained exempt. The Royal Navy also impressed seamen from inbound British merchant ships at sea, though this was done by individual warships, rather than by the Impress Service. 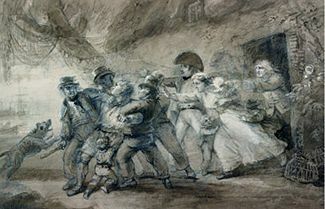 Impressment, particularly press gangs, became consistently unpopular with the British public (as well as in the American colonies), and local officials often acted against them, to the point of imprisoning officers from the Impressment Service, or opposing them by force of arms. At the time of the Battle of Trafalgar over half the Royal Navy's 120,000 sailors were pressed men. The power of the Impressment Service to conscript was limited by law to seafarers, including merchant seamen, longshoremen and fishermen. There is no basis to the widespread impression that civilians without any seafaring background were randomly seized from home, country lane or workplace by press gangs or that the latter were employed inland away from coastal ports. However, convicted petty criminals were often given the option of volunteering for naval service as unskilled "quota men" by inland courts (see below). There were occasions when the local populace would band together to oppose the activities of the press. 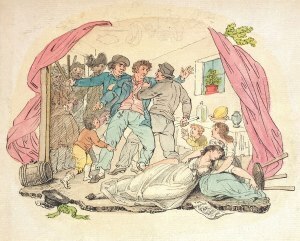 One such incident, the Easton Massacre in 1803, resulted in a press gang firing on a crowd, killing four people in the village of Easton on the Isle of Portland, where they were trying to impress the quarrymen. In 1808, Thomas Urquhart was saved from a press gang of three or four men when London passersby intervened. Urquhart complained to local officials, identified at least one of the men involved and successfully sued for damages in the Court of King's Bench. He went on to lobby for changes in law and practice, publishing Letters on the evils of impressment: with the outline of a plan for doing them away, on which depend the wealth, prosperity, and consequence of Great Britain in 1816. Patrolling in or near sea ports, the press gang would try to find men aged between 15 and 55 with seafaring or river-boat experience, but this was not essential; those with no experience were called "landsmen". From 1740, landsmen were legally exempt from impressment, but this was on occasion ignored in wartime unless the person seized was an apprentice or a "gentleman". Two landsmen were considered by captains to be the equivalent of one able seaman. If a landsman was able to prove his status to the Admiralty he was usually released. Court records do however show fights breaking out as people attempted to avoid what was perceived as wrongful impressment, and the London Times reported occasions when press gangs instituted a "hot press" (ignoring protections against impressment) in order to man the navy. The Neglected Tar, c. 1800, evokes the effects of impressment on a seaman's family and home. Merchant seamen ashore from their ships (and usually conspicuous by their clothing and general appearance) were however another matter. Anyone with seafaring experience encountered in the street would first be asked to volunteer for naval service. If the potential recruit refused he was often plied with alcohol or simply seized and taken. A commonly held belief is that a trick was used in taverns, surreptitiously dropping a King's shilling ("prest money") into a man's drink, as by "finding" the shilling in his possession he was deemed to have volunteered, and that this led to some tavern owners putting glass bottoms in their tankards. However, this is a legend; press officers were subject to fines for using trickery and a volunteer had a "cooling-off" period in which to change his mind. The great majority of men pressed were taken from merchant ships at sea, especially those homeward bound for Britain. This was legal as long as the Navy replaced the man they took, and many Naval captains would take the best seamen, replacing them with malcontents and landsmen from their own ship. It was also common for "trusted" volunteers to act as substitutes; they would then desert as soon as the merchant ship docked, and return to their Navy ship. Outbound merchant ships, officers and apprentices were exempt from impressment. When war broke out the Navy would deploy frigates and vessels off the coast to intercept inbound merchantman. Reportedly some merchant captains redirected their ships to Irish ports to offload favoured crewmen, before making final land-fall in England. In 1740, a merchantman fired on a cruiser attempting to impress its crew; threats of similar violence to avoid sailors being pressed were supposedly not uncommon, especially with the East India ships whose crews had been away from their families and England for a considerable time. In times of an extreme shortage of men, the Navy would "embargo" the coast for a short time; merchantmen had to supply a portion of their crew in exchange for permission to sail. Many merchant ships had hiding places constructed where their best crew could hide when approached by a Naval vessel. In addition to impressment, Britain also used the Quota System (or The Quod) from 1795 to 1815, whereby each county was required to supply a certain number of volunteers, based on its population and the number of its seaports. Unlike impressment, the Quota System often resulted in criminals serving on board ships as counties who failed to meet their quota offered prisoners the option of completing their sentence or volunteering. Apart from the probably lower quality of recruits taken by this means, another downside of the Quota System was the frequent introduction of disease, especially typhus, to healthy ships. One of the largest impressment operations occurred in the spring of 1757 in New York City, then still under British colonial rule. Three thousand British soldiers cordoned off the city, and plucked clean the taverns and other sailors' gathering places. "All kinds of tradesmen and Negroes" were hauled in, nearly eight hundred in all. Four hundred of these were "retained in the service". The Royal Navy also used impressment extensively in British North America from 1775 to 1815. Its press gangs sparked resistance, riots, and political turmoil in seaports such as Halifax, St John's, and Quebec City. Nevertheless, the Royal Navy extended the reach of its press gangs into coastal areas of British North America by the early 19th century. In response, sailors and residents fought back with a range of tactics. They sometimes reacted violently. The riots in St John's in 1794 and Halifax in 1805 led to a prohibition on impressment on shore for much of the Napoleonic Wars. The protest came from a wide swath of the urban community, including elites, rather than just the vulnerable sailors, and had a lasting negative impact on civil–naval relations in what became Canada. The local communities did not encourage their young men to volunteer for the Royal Navy. The American Continental Navy impressed men into its service during the American Revolutionary War. The Continental Congress authorized construction of thirteen frigates, including USS Virginia in 1775. The senior captain of the Continental Navy, James Nicholson, was appointed to command Virginia, built and launched at Baltimore, Maryland. When Virginia was fully rigged and fitted out in 1777, Nicholson received orders to sail to Martinique, to deliver dispatches and take on a cargo of arms and ammunition for the Continental Army. Many of Nicholson's crew had deserted to sign on as privateers, for higher pay at less risk. With inadequate crew to comply with orders from Congress, Nicholson impressed about thirty citizens of Baltimore for service aboard Virginia, an act expressly forbidden by Maryland law. Maryland governor Thomas Johnson demanded immediate release of the impressed men. Nicholson refused, stating impressment was common practice in Philadelphia, Pennsylvania and some of the northern states. Congress convinced Nicholson to release the impressed citizens of Baltimore, to avoid problems with the State of Maryland, but the practice of impressment continued where the local state legislature or governor gave consent. Nicholson avoided the need for local government consent by stopping the American merchant ships Holker and Fair American at sea in 1780, to impress men from their crews. The individual states did not deny the concept of impressment for their own navies, but were reluctant to grant the right to the Continental Congress. The concept of drafting men into armed service remained contentious, even after adoption of the federal constitution. There is one documented case of a British seaman impressed by the US Navy in 1810. In 1795, the Jay Treaty went into effect, addressing many issues left unresolved after the American Revolution, and averting a renewed conflict. However, the treaty's neglect to address British impressment of sailors from American ships and ports became a major cause of complaint among those who disapproved of it. While non-British subjects were not impressed, Britain did not recognize naturalised American citizenship, and treated anyone born a British subject as still "British"; as a result, the Royal Navy impressed over 9,000 sailors who claimed to be American citizens. During the wars with France (1793 to 1815), the Royal Navy aggressively reclaimed British deserters on board ships of other nations, both by halting and searching merchant ships, and, in many cases, by searching American port cities. Although this was illegal, Jefferson ignored it to remain on good terms with Britain as he was negotiating to obtain "the Floridas". This changed in 1805 when the British began seizing American merchantmen trading with the West Indies and condemning the ships and their cargoes as a prize and enforcing impressment on their crews. Under the Rule of 1756, in times of war, direct trade between a neutral European state and a British colony was forbidden if such trade had not existed in time of peace. The Americans had found a way around this by "landing" cargoes from Europe in the United States and issuing certificates that duty had been paid. The ship would then sail, with the cargo never having been offloaded or duty actually paid, as now bona fide commerce between neutral America and the West Indies. The British became aware of the practice during the court case involving the seizure of the Essex. The court ruled that the cargo of the Essex had never been intended for American markets so the voyage had not been broken and could thus be considered continuous. The end result was the blockade of New York Harbor by two British frigates, the Cambrian and the Leander, which provoked public demonstrations. For the next year scores of American ships were condemned in admiralty courts and American seamen were impressed with increasing frequency until, in the early summer of 1807, when three deserters from the British frigate HMS Melampus lying in Chesapeake Bay enlisted on the American frigate USS Chesapeake. After searching the Chesapeake, the deserters, David Martin, John Strachan, and William Ware, were found to be native-born Americans who had been wrongly impressed. The search also established that another crew member listed as Jenkin Ratford, was actually a British deserter, but he could not be found. Admiral Berkeley angrily issued an order to all commanders in the North Atlantic Squadron to search the Chesapeake if encountered on the high seas. Eight miles southeast of Cape Henry a boat from the British frigate HMS Leopard intercepted her but Commodore Barron declined to permit his crew to be mustered. The Leopard began approaching and the commander shouted a warning to which Barron replied "I don't hear what you say". The Leopard then fired two shots across the bow and almost immediately poured a broadside into the American ship. The Chesapeake did not return fire but the British ship fired another two broadsides. Three crew were killed and eighteen wounded. The British boarding party not only arrested the British deserter but also the three Americans. The Chesapeake–Leopard Affair provoked an outcry for war from all parts of the country and Jefferson later wrote: "The affair of the Chesapeake put war into my hand, I had only to open it and let havoc loose". He ordered the state governors to ready their militias but the Embargo Act of 1807 he eventually passed only ordered all British armed vessels out of American waters and forbade all contact with them if they remained. As a cause of the War of 1812, the impressment and ship seizures caused serious diplomatic tension, and helped to turn American public opinion against Britain. Impressment was widely perceived as humiliating and dishonoring the U.S. because it was unable to protect its ships and sailors. Britain fought the war against Napoleon on the high seas, enlarging its Royal Navy from 135 ships in 1793 to 584 in 1812, and expanding personnel from 36,000 seamen in 1793 to 114,000 in 1812. In Spring 1814, Napoleon surrendered, the British restored the Bourbon kings to the throne, and France was now an ally of Great Britain. The French Navy and the French merchant Marine switched sides, and the naval war in Europe was over. Britain could now sharply reduce its Royal Navy. It had no need to impress sailors, and never again used that technique against Americans, although it did not officially renounce the practice. In the next war, against Russia in 1853, a new system of fixed-term engagements gave the Royal Navy a sufficient number of volunteer recruits to meet its manpower needs until World War I, when conscription was used for all the military services. In the intervening period, with much reduced manpower needs and improved conditions of service, the navy was able to rely on voluntary enlistment, plus the recall of reservists when necessary, to meet its requirements. The first Act of Parliament legalising this practice was passed in the reign of Queen Elizabeth in 1563 and was known as "An Act touching political considerations for the maintenance of the navy". It was renewed many times until 1631. In the Vagabonds Act 1597, several lists of persons were subject to impressment for service in the fleet. Following the execution of King Charles I, the Rump Parliament passed several acts in 1649 and 1650 concerning the encouragement of officers, mariners and for the impressment of seamen (e.g. 22 February 1648/9). In 1695 an Act was passed to build a permanent register of 30000 men for ready call-up by the navy, "without having recourse to the barbarous and unconstitutional practice of pressing". The act also established basic rules and benefits for all types of seamen, including access to Greenwich Hospital. With wars raging in Europe and in America the Navigation Act 1703 (2 & 3 Ann. c. 6) was passed "for the Encrease of Seamen and better Encouragement of Navigation, and the Protection of the Coal Trade". This act gave parish authorities the power to indenture and apprentice boys to the sea, from as young as 10, until age 21; it also reaffirmed that rogues and vagabonds were subject to be pressed into the navy. The act establishes administration and regulations for the act, including youth who volunteer for the indenture and certain seamen engaged in the coal trade supplying cities, are exempt from impressment for three years. This act was followed by the Recruiting Act 1703 (2 & 3 Ann. c. 13), which allows impressing able-bodied men into the army and navy who did not have visible means of subsistence; also as a wartime measure the act relaxes English crewing requirements under the Navigation Acts, to make experienced English seamen more available to serve on ships of war. In 1740, impressment was limited to men between 18 and 45, and it also exempted foreigners. As part of a wider effort to build colonial capability and harass its enemies, Parliament passed the Trade to America Act 1707 (6 Ann. c. 64). Section 9 mandated that mariners serving on board privateers and trading ships in any part of America, and those on shore, are not liable for impressment. Lingering questions remained whether the law applied only to the navy, or to civil authorities as well, and whether it applied only to the current war or to all future wars. Two attorneys-general of Great Britain, one in 1716, and another in 1740, issued opinions that the 1707 Act was no longer in effect, but many American colonists disagreed. Despite doubts over the continuing legality of impressment in continental waters, but for similar reasons, Parliament passed the Sugar Trade Act 1746 (19 Geo. 2 c. 30) stating that impressment was forbidden in the West Indies, but it added certain exceptions and made no specific mention of America. This would lead to the Knowles Riot in Boston the following year, and continuing colonial questions, particularly in heavily maritime New England. The last law was passed in 1835, in which the power to impress was reaffirmed. This limited the length of service of a pressed man to five years, and added the provision that a man could not be pressed twice. Although Britain abandoned the practice of impressment in 1815, impressment remained legal until the early 1900s, and the various laws authorising impressment have never been repealed. Starting in 1645, the New Model Army raised by Oliver Cromwell to overthrow Charles I during the English Civil War was largely manned by impressment. After the restoration of the monarchy, impressment into the army was discontinued. During the American Revolutionary War, after the losses at the Battle of Saratoga and the impending hostilities with France, the existing voluntary enlistment measures were judged to be insufficient. Between 1775 and 1781, the regular army increased from 48,000 to 110,000. Two acts were passed, the Recruiting Act 1778 and the Recruiting Act 1779, for the impression of individuals into the British Army. The chief advantages of these acts was in the number of volunteers brought in under the apprehension of impressment. To avoid impressment, some recruits incapacitated themselves by cutting off the thumb and forefinger of the right hand, making it impossible to use a musket or sword. The Recruiting Act of 1779 was repealed on 26 May 1780, and army impressment was permanently discontinued. During the experiment, the British government allowed army impressment under severely restricted circumstances — both acts emphasized volunteering over impressment, and offered strong incentives to volunteers as a "carrot and stick" tactic, to encourage the men to volunteer lest they be pressed instead. The impressment portion of the 1778 Act applied only to Scotland and the area around London, excluding Wales and the rest of England, to avoid interfering with harvesting. The 1779 Act applied to all of Great Britain, but was initially suspended everywhere except the area around London, and actually applied to all of Great Britain for only six months, until the 1779 act was repealed in May 1780, and army impressment ceased in Britain. Unlike naval impressment, army impressment applied only to "able-bodied idle, and disorderly Persons, who could not, upon Examination, prove themselves to exercise and industriously follow some lawful Trade or Employment, or to have some Substance sufficient for their Support and Maintenance", as well as smugglers, according to the 1778 law, but excluding from that any men who were voters, or harvest workers. The 1779 law extended impressment also to "incorrigible rogues" who had abandoned their families, and left them as expenses on the parish. Impressed apprentices were released under appeal from their masters, and impressed foreigners were released when requested by their countries' embassies. The events in Elizabeth Gaskell's novel Sylvia's Lovers (1863) take place against the background of the practice of impressment during the early phases of the Napoleonic Wars. Charlie Kinraid is forcibly enlisted in the Royal Navy by a press gang and later Sylvia Robson's father is executed for leading a revengeful raid on press-gang collaborators. In Herman Melville's novel Billy Budd, Sailor, first published in 1924, and in the opera and film based on it, Billy is impressed to service on a British warship from Right-of-Man, a merchant ship. In Hornblower and the Atropos by C. S. Forester, Captain Horatio Hornblower is depicted, when urgently needing sailors to make up his crew, as stopping a ship of the British East India Company and impressing a large part of its sailors – the sailors being very reluctant, since conditions in the Royal navy ships were far worse than in those of the civilian Company. Elizabeth Barrett Browning's first published poem, "On the Cruelty of Forcement to Man" (c. 1812, when she was six years old), addressed impressment. John Ashton's 1888 compilation Modern Street Ballads includes "Victory", relating the plight of a young aristocratic lady whose parents, disapproving of her poor suitor, arrange to have him pressed to service aboard Lord Nelson's flagship of that name, aboard which he is killed at the Battle of Trafalgar. Garage punk band The Murder City Devils' song "Press Gang", from their album In Name and Blood, is about a man who becomes "a victim of the press gang", a group of soldiers which brings him from a ship at sea to a town and publicly hangs him for unnamed offenses. ^ During the 18th century, a Royal Navy Able Seaman was paid (after deductions) 22 shillings and 6 pence per month. Pay was reckoned by the 28-day lunar month, so the annual rate of pay was somewhat more than 12 times this. A farm worker of the era might earn around a quarter to a third of this. Wages on merchant ships were higher: 25 to 30 shillings per lunar month - and increased further during wartime (merchant pay rates of 70 shillings per month at London and 35 shillings at Bristol were offered during the Seven Years War). But merchant crews could be cheated of their pay in several ways by dishonest ship-owners. ^ a b c Hill, J. R. (2002). The Oxford Illustrated History of the Royal Navy. Oxford University Press. pp. 135–137. ISBN 0-19-860527-7. ^ "Myths of Nelson's Navy". Timewatch. 2000. BBC. ^ a b c Price, Catherine (2017). "The Age of Scurvy". Distillations. 3 (2): 12–23. Retrieved April 17, 2018. ^ Fischer, Lewis R.; Nordvik, Helge W. Shipping and Trade, 1750-1950: Essays in International Maritime Economic History 1990, p. 25. For example, the frigate HMS Hermione, with a regular complement of 180 men had 129 desertions between 1793 and 1797. Desertion rates for Dutch and French warships was even higher with annual rates of up to 90% not uncommon. In 1795, the Dutch vesselStaaten Generaal, with a complement of 550 lost 428 to desertion, the Delft, with 350 men lost 340. ^ a b "Impressment: the Press Gangs and Naval Recruitment". Royal Naval Museum. Retrieved 19 August 2013. ^ a b Conditions of service in Britain's maritime organisations Archived 31 March 2012 at the Wayback Machine pp. 39–40. ^ Adkins, Roy; Adkins Lesley (2006). The War For All The World's Oceans. Lancaster Place, London. : Little, Brown Book Group. pp. 109–110. ISBN 0-316-72837-3. ^ a b Urquhart, Thomas (1816). Letters on the evils of impressment: with the outline of a plan for doing them away, on which depend the wealth, prosperity, and consequence of Great Britain. London: J. Richardson. pp. 49–55. ISBN 978-1169103108. Retrieved 19 April 2018. ^ BBC History Magazine, Vol.9 no. 8, August 2008. ^ a b Pope, Dudley (1996). Life in Nelson's Navy. Naval Institute Press. p. 99. ISBN 1-55750-516-0. ^ Keith Mercer, "Northern Exposure: Resistance to Naval Impressment in British North America, 1775–1815", Canadian Historical Review, June 2010, Vol. 91 Issue 2, pp. 199–232. ^ Fowler, William M., Jr. "The Non-Volunteer Navy". United States Naval Institute Proceedings August 1974 pp. 75–78. ^ Paul A. Gilje, "'Free Trade and Sailors' Rights': The Rhetoric of the War of 1812", Journal of the Early Republic, Spring 2010, Vol. 30 Issue 1, pp. 1–23. ^ James Fulton Zimmerman, Impressment of American Seamen (1925). ^ Adam Anderson (1787). An historical and chronological deduction of the origin of commerce..., pp. 624–625. ^ a b Rodger (2004), p. 316. ^ "New Model Army (England)". ^ "The British Army - Chapter Three". ^ a b Curtis, chapter 3. ^ "On the Cruelty of Forcement to Man Alluding to the Press Gang". Elizabeth Barrett Browning Selected Poems. ^ "The Murder City Devils - Press Gang Lyrics - Genius Lyrics". Genius. Retrieved 2016-08-19. Cray, Robert E., "Remembering the USS Chesapeake: The Politics of Maritime. Death and Impressment," Journal of the Early Republic (Fall 2005) vol 25 pp 445–74. Ennis, Daniel James. Enter the Press-Gang: Naval Impressment in Eighteenth-Century British Literature (University of Delaware Press, 2002). Lewis, Michael. A Social History of the Navy 1793-1815 (1960). Rodger, N. A. M. The Wooden World: An Anatomy of the Georgian Navy. W. W. Norton and Company, 1986. Rodger, N. A. M. The Command of the Ocean: A Naval History of Britain, 1649–1815. W. W. Norton and Company, 2004. Sawtell, Clement Cleveland, "Impressment of American Seamen by the British," Essex Institute Historical Collections 76#4 (October 1940): pp. 314–44. Selement, George. "Impressment and the American Merchant Marine 1782–1812: an American View." The Mariner's Mirror 59#4 (1973): 409-418. Steel, Anthony (1952). "Impressment in the Monroe-Pinkney Negotiation, 1806-1807". The American Historical Review. American Historical Association. 57 (2): 352–69. doi:10.2307/1849880. ISSN 1937-5239. JSTOR 1849880 – via JSTOR. (Registration required (help)). Usher, Roland G., Jr. (1951). "Royal Navy Impressment During the American Revolution". The Mississippi Valley Historical Review. Organization of American Historians. 37 (4): 673–88. doi:10.2307/1889363. ISSN 0161-391X. JSTOR 1889363 – via JSTOR. (Registration required (help)). Look up impress in Wiktionary, the free dictionary. Chisholm, Hugh, ed. (1911). "Impressment" . Encyclopædia Britannica (11th ed.). Cambridge University Press. The Impress Service, basic article on "press gangs" in British ports, charged with impressing sailors into the Navy. example of impressment of HMS Pandora crew in 1790.